Living in Mexico, my family and I are experiencing first-hand the nightmare that is the war on drugs. In March 2014, my 19-year-old son, Gerson Quevedo Orozco, who was studying architecture at university, was kidnapped while in a convenience store with a couple of friends in Veracruz. The first my husband and I heard about it was when we received a call asking for 80,000 pesos in exchange for our son. We paid the ransom and were waiting for Gerson to be returned, when a supposed “friend” of his stopped by and told us he knew where our son was. My other son, Alan, and my daughter’s boyfriend, Miguel, immediately went to find him. But a van followed them. The people it was carrying got out and shot them dead. Alan and Miguel became part of the more than 100,000 deaths in Mexico since the drug war began. Since this happened in our local neighbourhood, we decided it would be unsafe to return home. We’ve been back only once – with police protection – to grab the clothes Alan would wear at his funeral. My family are now victims of forced internal displacement. 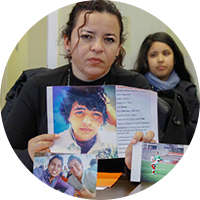 We are just one family out of more than 280,000 people displaced in Mexico, and my son is just one of more than 20,000 missing because of drug-war violence. I will continue to demand justice for my family and will continue to search for my son. The drug war has devastated both my family and my country.